I’m all about meals that come together in minutes. Because even as someone who loves to cook, there are some days or nights that I’m just exhausted. I still want something delicious, I just don’t want to spend a ton of time making it. That’s when I lean heavy on the veggies and whole grains. Not because I’m a dietitian, but because I’m a mom and a wife who’s usually left with the task of getting food on the table. I know that veggies and grains can be prepped and cooked easily. That’s why they’re a mainstay in my pantry, fridge and freezer. I’ll build the base around the whole grain. If I’m lucky, I’ve got that already cooked and in the freezer. So I’ll pull that out and re-heat it. Next, it’s those veggies. What do I have? Leftover cooked veggies? Perfect! A bag of spinach? Yes! Let’s add that too. Every meal needs flavor too, so I look for flavorful cheese like feta or sharp cheddar. Then I conquer some kind of sauce or dressing. Maybe I’ll use a vinaigrette or salsa or tahini. Next it’s all about the toppers. I am a huge fan of nuts and seeds, especially in veggie-ful meals. So I will reach for pumpkin seeds, pecans, pistachios, almonds or walnuts for a little protein and a lot of crunch. And that’s it. Dinner is made! My advice on quick-fix meals? Don’t over-complicate it and load up on those whole grains and veggies. You’ll be surprised at how quickly your meal will come together! Need some inspiration? 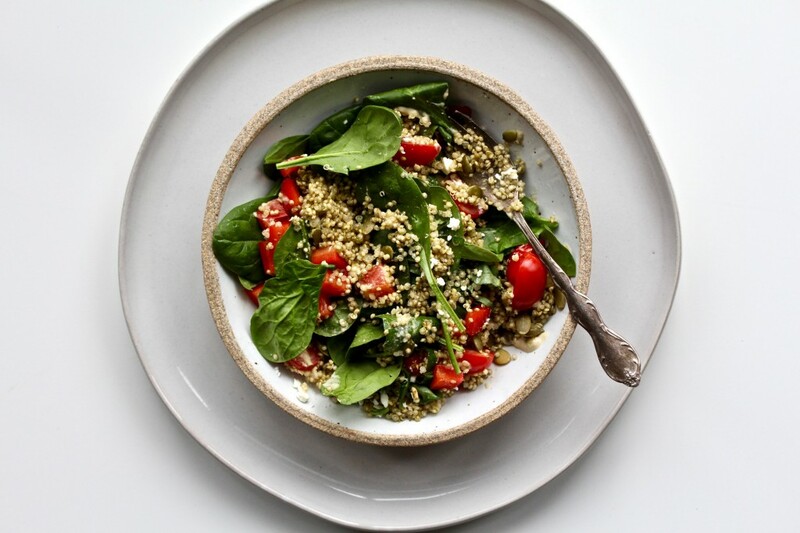 Try the Vegetarian Pesto Quinoa Bowl below. If you’re feeding your family, just scale the recipe up a bit to make sure you’ve got enough for everyone! Place the quinoa in the bottom of a large bowl. Mix the pesto into the quinoa and then top with the spinach, bell pepper, tomatoes, olives, pumpkin seeds, feta and basil. Stir the hummus with the water in a separate, small bowl. Drizzle over quinoa bowl and enjoy!